TV Overmind(31st) - 'Doctor Who' Film: "They Are Doing It"
io9(30th) - Doctor Who's New Future Gameshow Spin-Off: WTF? Quiet news day today; there is a video preview for The Specials DVD boxed set available to view from Chicago Now and Pop Culture Zoo. Most interesting article of the day goes to a story in Scientific American on how astronomer Dr Megan Argo has written up a scientific paper about a new discovery relating to supernovae in the form of a Doctor Who story! See more coverage on this story at the Doctor Who News Page. Main news for this summary is about the release of the animated adventure Dreamland onto DVD in the United States, and that Imagination Games have announced that they are developing two Doctor Who board games to be released for the end of the year (i.e. Christmas!). CBBC(26th) - Will David Tennant be the Hobbit? BBC Worldwide have issued a press release for the release of the latest in their collection of classic stories on audio. The Ice Warriors, from season five, was a six-part adventure starring Patrick Troughton as the Doctor, with Frazer Hines as Jamie and Deborah Watling as Victoria. It was novelised in 1976 by Brian Hayles, and this four disc CD collection presents the unabridged novelisation with narration by Frazer Hines. The world is held in the grip of a second Ice Age, and faces total destruction from the rapidly advancing glaciers. Doctor Who, with Victoria and Jamie, lands at a top scientific base in England, where they have just unearthed an ancient Ice Warrior. Aliens from Mars, preserved in the ice for centuries and now revitalised, the Ice Warriors feel ready to take over... Can the Doctor overcome these warlike Martians and halt the relentless approach of the ice glaciers? Airlock Alpha(23rd) - Back Off Fox, 'Torchwood' Is Our Show! Entertainment Weekly(24th) - Exclusive: 'Rex Is Not Your Lawyer' DOA at NBC? Zath(22nd) - BBC Games Based On Doctor Who & Top Gear TV Shows? Guardian(19th) - Will a US version of Torchwood work? After Elton(22nd) - Don't let perfect be the enemy of good. The Phoenix(19th) - Torchwood comes to America? Digital Spy(19th) - Fox planning American 'Torchwood'? ATV News Network(20th) - Season Four of Sarah Jane Adventures confirmed? Total Film(21st) - Is David Tennant Bilbo Baggins? Obsessed with Film(21st) - Gollum replaces former Dr. Who in John Landis’ BURKE & HARE! Guardian(21st) - BBC getting back into games - but which shows would work best? SFX(21st) - Could Proper Doctor Who Computer Game Be Imminent? The fifteenth National Television Awards took place at the O2 in London on the 20th January, and the world of Doctor Who did well once more! The series itself received its fifth consecutive award in the Drama category, whilst actor David Tennant once again won the award for Drama Performance. Full news on the event can be found at the Doctor Who News site. The Sun(22nd) - Cheeky, Simon! Den of Geek(18th) - Is Doctor Who’s new assistant a kissogram? Reuters(19th) - Fox developing U.S. version of "Torchwood"
TV Overmind(19th) - Torchwood to get US version on FOX? ATV News Network(19th) - Special Report: BBC Drama – Where Could the Axe Fall? TV Scoop(14th) - Is Star Trek better than Doctor Who? Tribune Magazine(14th) - Who’s here, there and everywhere? Random Perspective(14th) - David Cameron "Wants to be New Doctor Who"
The Stage(13th) - Long-running drama? What long-running drama? The BBC have published a press release to highlight their Winter/Drama schedule; as well as Doctor Who starring Matt Smith, shows also include A Passionate Woman with former companion 'Rose', Billie Piper (Rose), and Lennon Naked with former Doctor Christopher Eccleston and Torchwood's 'Tosh', Naoki Mori. TV Scoop(13th) - BBC announce schedule for spring, including new Doctor Who and Billie Piper! SFX(9th) - Tovey for Torchwood? Wales on Sunday(10th) - Who knows what went on? Diocese of Lichfield(9th) - Being involved in God’s mission is like being Dr Who - only it’s real! Digital Spy(8th) - Russell Tovey to join 'Torchwood' team? io9(7th) - A Torchwood Musical, With Music By ABBA? Really? Doctor Who Adventures magazine has launched an innovative lenticular cover, featuring a morph between the Tenth Doctor, played by David Tennant, and eleventh doctor, played by Matt Smith. 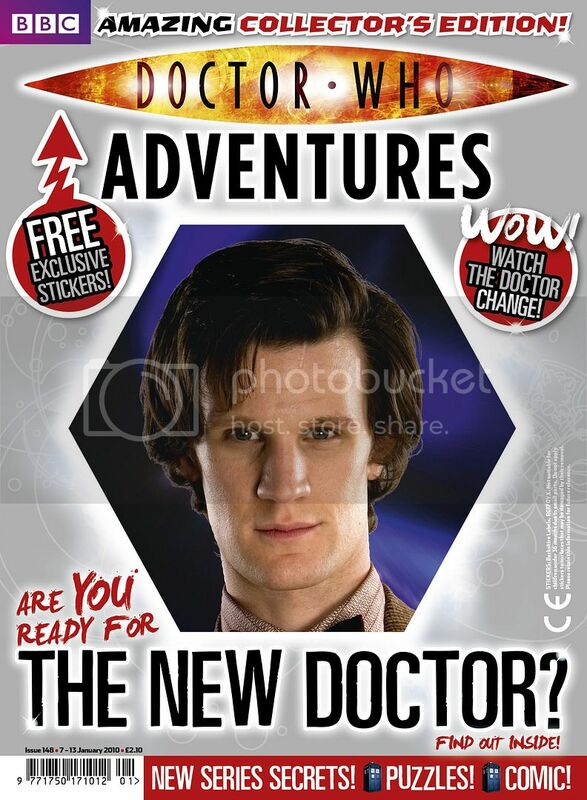 Following on from The End of Time episodes of Doctor Who at Christmas and New Year, Doctor Who Adventures magazine brings the regeneration to life on its cover, with a specially commissioned shot of Matt Smith. Issue 148 is set to be a collector's issue and the original design concept is the first time a BBC Magazines' children's cover has featured the lenticular technology. The process is created by lenticular printing, a multi-step process consisting of creating a new image from at least two existing images, and combining it with a lenticular lens. According to editor of Doctor Who Adventures, Moray Laing: "Our collector's issue magazine is a fitting tribute to David Tennant's final episode and the start of a new series of adventures with Matt Smith as the Eleventh Doctor. We are really proud to have produced such an innovative cover to celebrate the regeneration and believe it will have real impact on the newsstand." The item was also reported by Licensing.Biz. The Guardian(7th) - Do you trust Richard Curtis and Simon Nye with Doctor Who? ATV Network(6th) - Torchwood: The Musical?? The Faster Times(7th) - What’s Up With the Brits and Their Weird Snacks? We've received complaints from viewers who believed a line in the second part of Doctor Who: The End of Time was insulting to people with ginger hair. The Guardian(6th) - Doctor Who: Tardiscrimination? You can also find details on the clarification from The Doctor Who News Page.